I'm back with another first impression for you. I got a little tiny sachet of L'Oreal BB cream. This is not a new product. It's been out a while, but I just haven't had the chance to try it out yet. I was digging into my pile of sample sizes and found this. I think it was from a magazine or something I can't really remember. The shade I got was light. I forgot to take a picture right after I did my makeup, my bad. The pictures below were taken after a full day. I had my makeup on for a good 9 hours at least. I didn't use any powder because I wanted to test its lasting power. I did apply some blush and bronzer, which is hard to tell by looking at the picture. The coverage it provided still looked good after a hot summer day in north California. I noticed my T-zone became slightly oily, but it should be okay with powder. Random lipstick swatches. I was trying on different shades for my friend's makeup starter kit. Basically I helped her pick out products for her to try out since she's new into this whole makeup thing. She wants products that she can wear everyday and appropriate for work. A blog post is coming up! By the way, this is the second BB cream I've tried ever. The first one was from Maybelline. I did a blog post about it a while back. BB cream is said to be somewhere between tinted moisturizer and foundation, but really I just think the whole idea of BB cream or CC cream or whatever is just another marketing gimmick. They're basically foundation, something you wear as a base for your makeup. Anyway, back to the product, I've only used it once since that's the only amount of product I had from the sample. I like how it doesn't completely fade out at the end of the day. My face still looked even and you still can see slight color which means that the product doesn't oxidize badly. The only problem I had is the shine. My face isn't really on the oily side, so when a product makes my skin oily than it's not really for me. It doesn't dry out my skin, which is a good thing. Overall, I'm surprised at how well the coverage of this bb cream. Yet, I don't think I'm gonna buy the full size but not because it's bad. It's just not really an outstanding product in my opinion. It might be a good product to try if you don't want a heavy, thick foundation. This feels light on my skin. 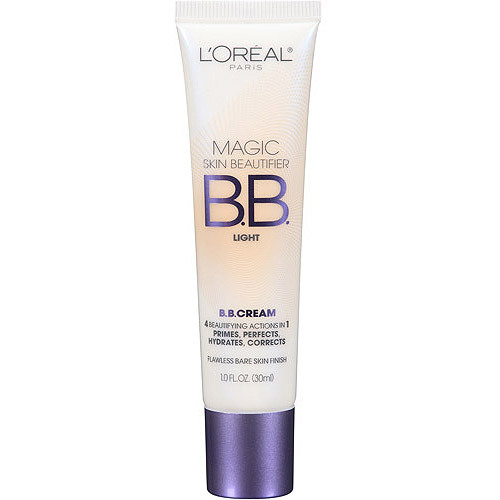 Have you tried L'Oréal Magic Skin Beautifier BB Cream?